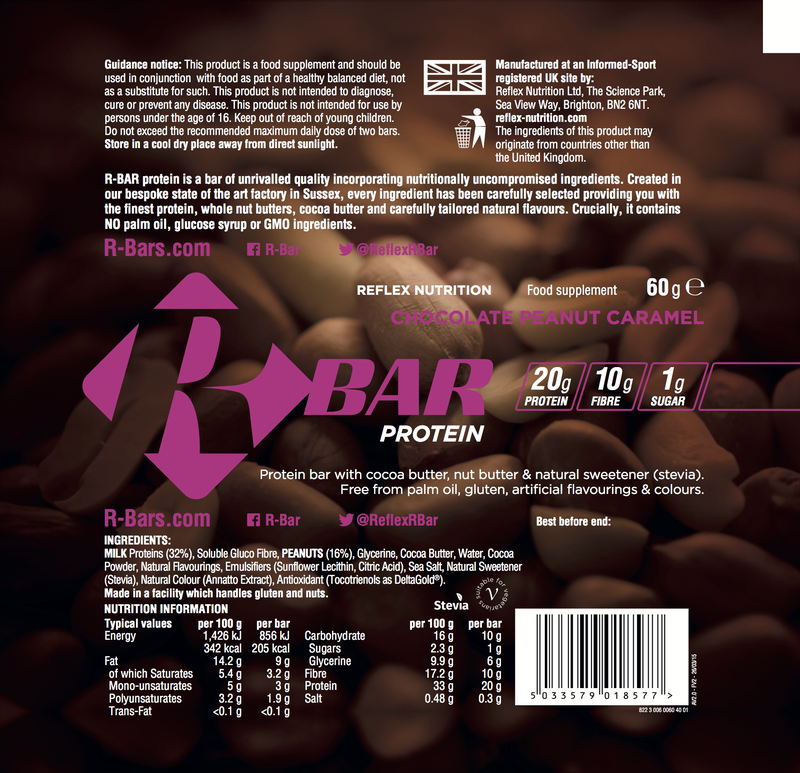 The main ingredients in our R Bars are EU sourced milk protein, gluco fibre, almonds, cocoa butter, cocoa powder, water, natural flavourings and natural sweetener stevia. 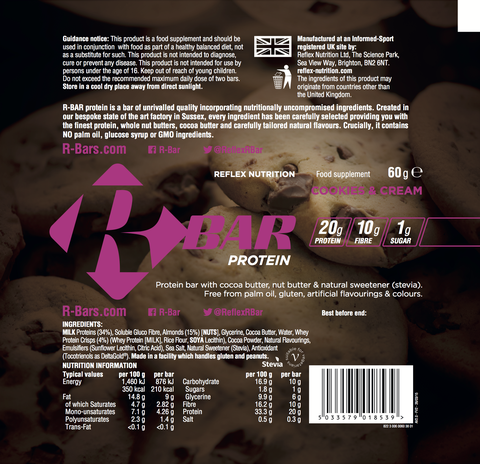 Following our ‘Protein bar none’ slogan, Reflex Nutrition’s R Bars are one of the only protein bars in the industry that are made in-house. Refusing to settle for the cheap and artificial ingredients other protein bar manufacturers offer, Reflex had not offered a protein bar for many years, so we decided to build our very own protein bar factory to make the highest quality protein bar on the market. R Bars are made in a responsible manner, with absolutely no palm oil used, due to its terrible environmental impact. 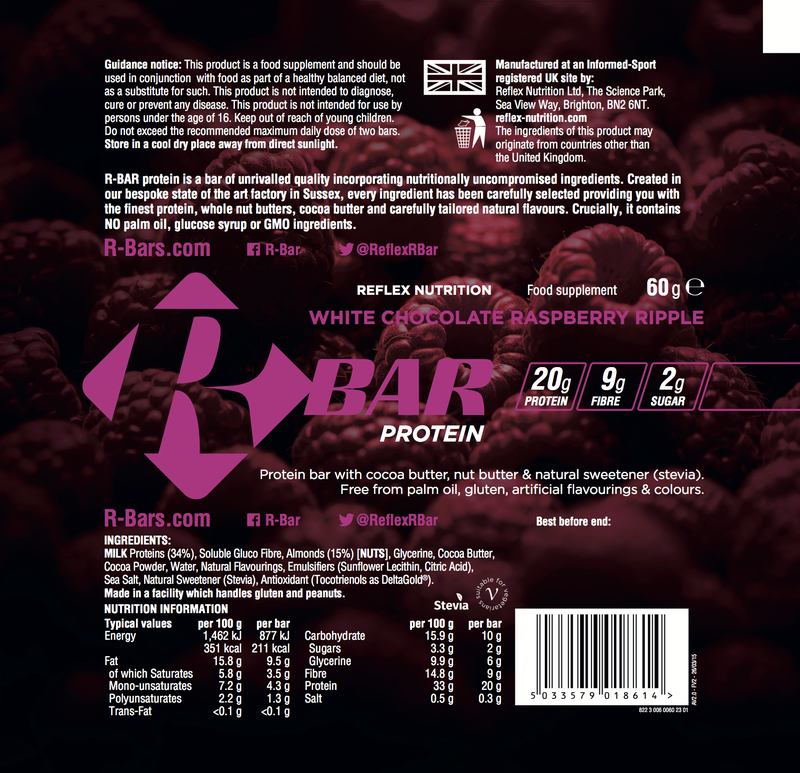 R Bars are also free from genetically-modified ingredients, corn syrup/solids, glucose syrup, invert syrup, preservatives, artificial flavours, artificial colours, artificial sweeteners, soy protein and any whey or milk protein not proven to be free from rBGH (recombinant bovine growth hormone). 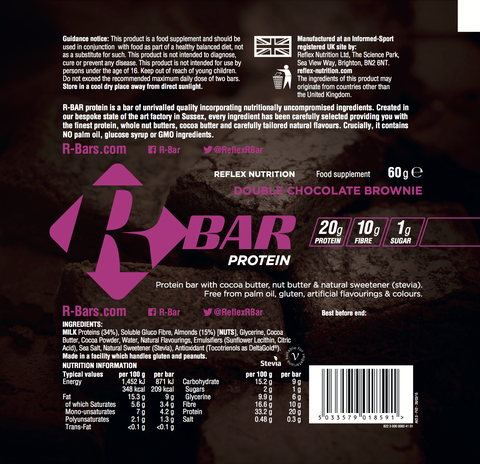 Just read our customer reviews for genuine, unbiased reports of how delicious our R Bar protein bars are! 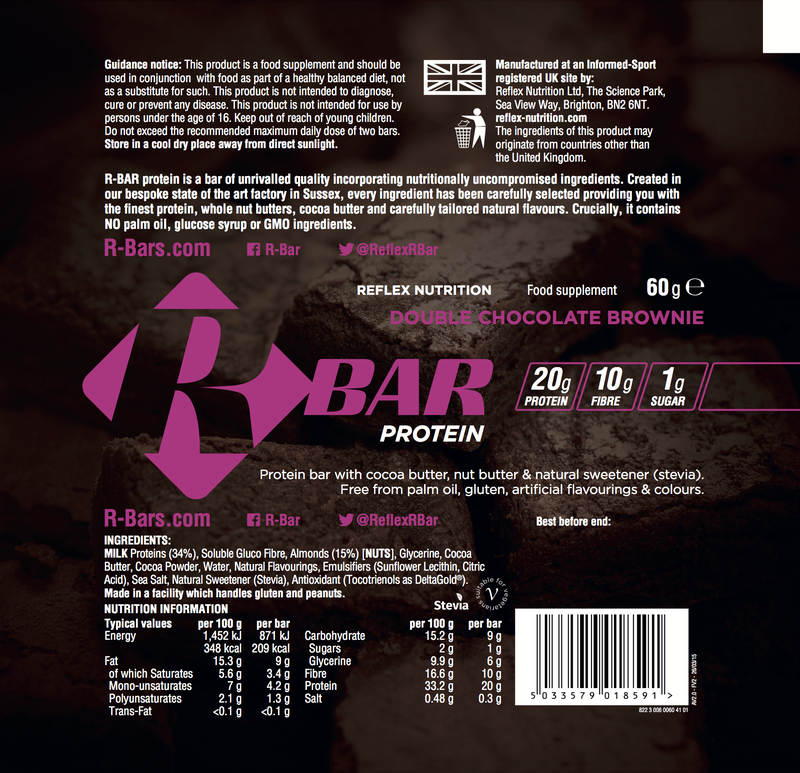 Made with pure almond or peanut butters, generous scatterings of chocolate chunks, freeze dried fruit and cocoa powder, these bars offers a truly tasty protein snack with a soft, almost gooey texture. 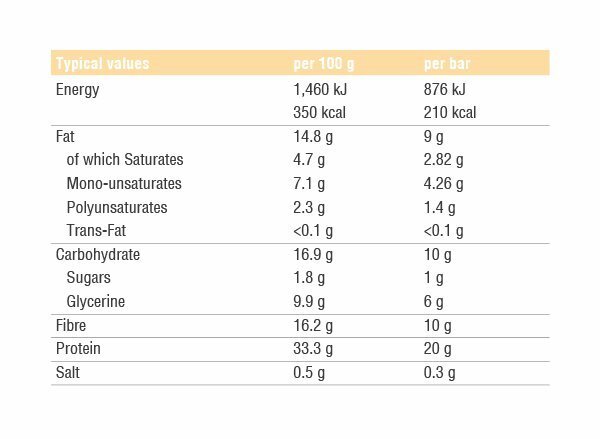 The protein in a Reflex R Bar is EU sourced from cattle that have been grass fed, with absolutely no rBGH (recombinant bovine growth hormone). 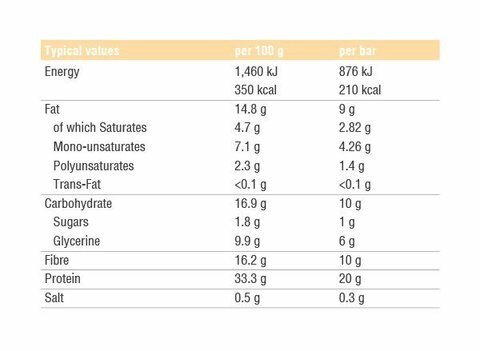 Created by separating the protein components from the fat molecules in milk, Reflex use only the highest quality whey protein. This protein forms the backbone of our bars, so it’s essential it is of the highest quality. We use almond or peanut butter in our protein bars; by roasting whole nuts with their skins on, before grinding them to a fine butter, this is the purest natural nut butter, with absolutely nothing else added. Nut butters are also a good natural source of poly and mono unsaturated fats, fibre, magnesium and vitamin E.
Instead of using invert syrups, IMO syrups, dextrose and glucose syrups, which are proven to raise blood sugar levels and must by law provide ‘not suitable for diabetics’ labels, we decided to break the norm and find our own natural sweetener for our R Bars. Gluco fibre is an award-winning alternative to sweetening syrups that we have extensively researched and tested. Gluco fibre is manufactured within the EU, from a reputable European company, is non-genetically-modified, with a minimal effect on blood sugar levels. R Bar (all flavours) has been certified as Halal safe by The Halal Trust. For further allergy advice, please read our suitability guide. Double chocolate brownie: milk proteins (33%), soluble gluco fibre, almonds (15%), glycerine, cocoa butter, cocoa powder, water, natural flavourings, sodium chloride, natural sweetener (stevia), antioxidant (tocotrienols as deltagold®). Cherry bakewell: milk proteins (35%), soluble gluco fibre, almonds (15%) [nuts], glycerine, cocoa butter, water, freeze dried cherries (2%), natural flavourings, citric acid, sea salt, natural sweetener (stevia), antioxidant (tocotrienols as deltagold®). 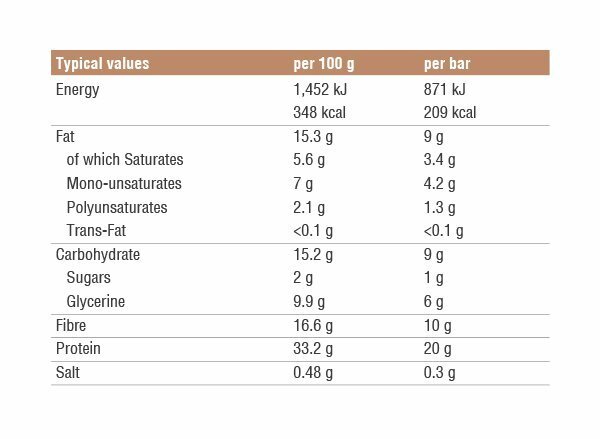 Chocolate peanut caramel: milk proteins (32%), soluble gluco fibre, peanuts (19%), glycerine, cocoa butter, water, cocoa powder, natural flavourings, sea salt, natural sweetener (stevia), natural colour (annatto), antioxidant (tocotrienols as deltagold®). Cookies and cream: milk proteins (32%), soluble gluco fibre, almonds (19%) [nuts], glycerine, cocoa butter, water, whey protein crispies(3%) (whey protein [milk], rice flour, soya lecithin), cocoa powder, natural falvourings, sea salt, natural sweetener (stevia), antioxidant (tocotrienols as deltagold®). White chocolate raspberry ripple: milk proteins (35%), soluble gluco fibre, almonds (15%) [nuts], glycerine, cocoa butter, water, freeze dried raspberries (2%), natural flavourings, citric acid, sea salt, natural sweetener (stevia), antioxidant (tocotrienols as deltagold®). Made in a facility which handles gluten and peanuts.